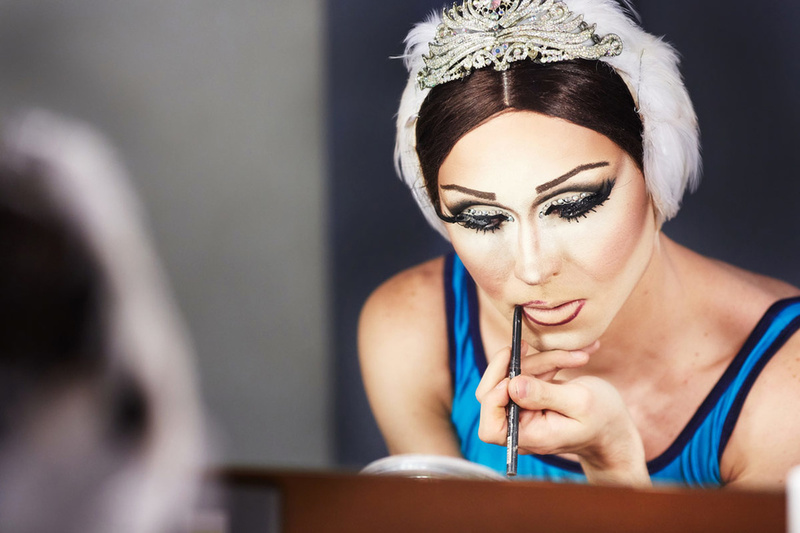 I was wondering if you could help me understand the culture of Trockadero as you see it. Do you think you were asked to be less feminine because being too realistic might take away the comedic aspect of the "guys in drag" gambit? The thing about Trockadero is that all the dancers are different: some are hairy and muscular and some are like me, built like a pre-pubescent boy. I am gender queer and there is a rainbow of gender in the company. It was never about my masculinity (or lack thereof) among critics, and they did appreciate and acknowledge the seriousness with which I took my female roles. When it came to the show, we were encouraged to be who we were. But in ballet class, it was a different story. We weren't allowed to express or present ourselves as we wanted; we couldn't wear our hair in buns. Even what you wore to the airport was monitored. Were there clauses in your contract about your appearance or conduct? There was no code of conduct, nor were there written guidelines about appearance. And you had spoken up about this? I had spoken with my artistic director [Tory Dobrin] about it several times. He always said he was concerned about how we would look in front of the crew and the presenters. Someone in the company once had to cut their hair because a television reporter assumed they were transgender. It was never acknowledged that it was unfair to ask this of us. What was the final straw for you? I decided to copy one board member on an email that described the harassment and bullying over our gender expression and identity. The artistic director said that the information in the email was not useful, and right away, I was retaliated against: I was not allowed to mentor other dancers, I was not allowed to speak out for other dancers, and a makeup sponsorship I had developed and managed for over two years for the company was taken away from me. After that I contacted two more board members, and was told they would need more dancers with allegations to launch an investigation. I followed up to let them know I had the stories of four current dancers and nine former company members. From then on the only response I received was silence. I decided to follow through on my threat to quit and did so on January 1st. Will you be following up with a legal claim or suit? Pending the outcome of the investigation, I will make a decision. If my claims are confirmed, then they may get rid of the management and hire me back as a dancer or as management. This would be the ideal situation for me. However, if the investigation is inconclusive or the claims are not confirmed, then I plan to take legal action. Are you looking to become a director? That is the really hard part, the organization had hinted that I might be the next director. But now it is unclear if that is possible. I have different visions of where I would want to see the company go. I would want to cast in a way that might change these classic stories. If Giselle was trans, the mad scene would be about her being displayed to the public. It would be a chance for a trans person to be taken seriously. At the moment though, I still want to dance. The U.K. National Dance Awards are helping me try to find a job. In the meantime, how are you coping? The dancers were so close-knit and such a family. No divas, never animosity. We just vented and coped. We tried to focus on our love of performing. But now, I am completely lost because my career is gone as far as me dancing as a ballerina. I have martyred myself for a cause I believe in. Are you still interested in transitioning? At this point, I call myself gender queer because I am not one gender more than another. I look male during the day time, but I am most comfortable performing as a woman. Women have been my heroes, and through women, I have strength. I aspire to have the strength of women. So for now, I am happy with just being who I am, even if I do not fit any mold. The older I get, the less I feel like I have to apologize for it.